Attendees gathered Sunday afternoon to show their support for the Beavercreek (Ohio) Police Department outside the city's Walmart Superstore that was the scene of a shooting on August 5th. 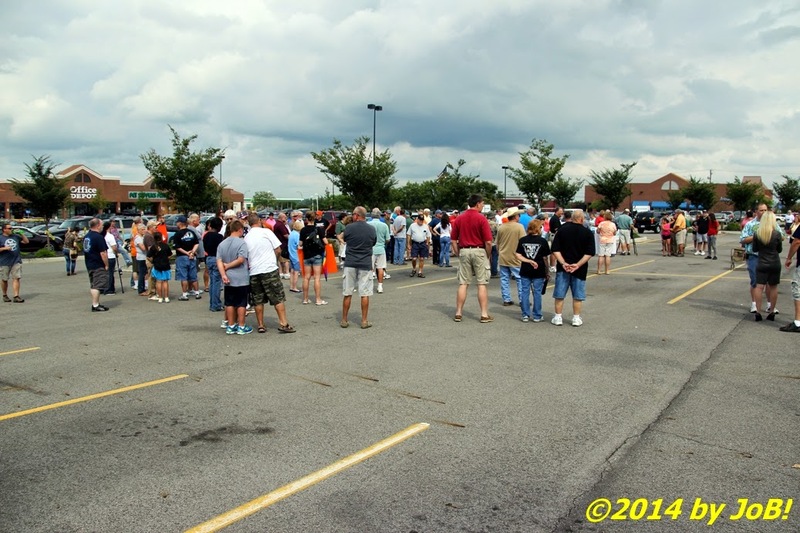 Despite overcast skies and a rain shower that forced many to seek shelter, approximately 150 to 200 people attended a Sunday afternoon Operation Shield BPD rally in support of the Beavercreek Police Department in an outer parking lot of the city's Walmart Superstore. This location was the same one used the previous afternoon for a rally by supporters of the family of John Crawford III who was shot in that same store on August 5th by one of two of that department's officers who responded to the 911 call. 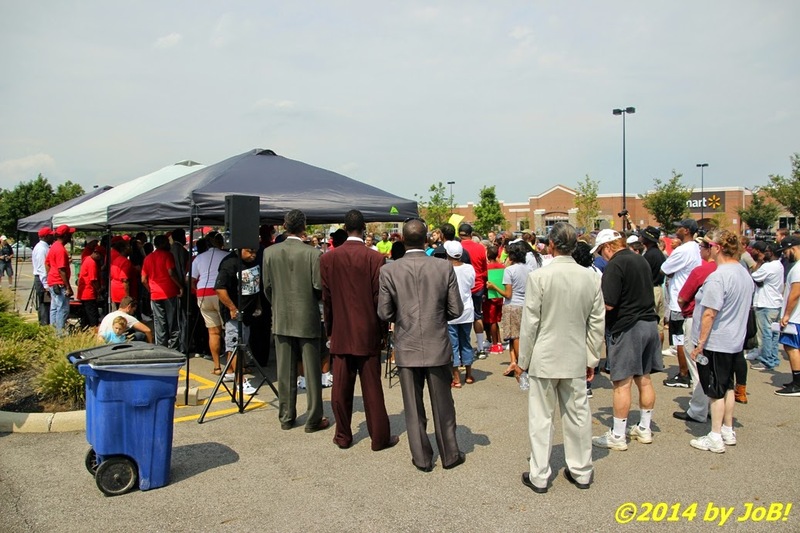 Several hundred people gathered on Saturday afternoon within sight of the Beavercreek, Ohio Walmart store where John Crawford III was shot and killed by a city police officer on August 5th. On a very warm Ohio afternoon, approximately 200 to 300 people assembled in Beavercreek, Ohio to attend the Justice For John Crawford Protest and Rally in support of the family of the 21-year old Cincinnati-area man gunned down by police officers at that city's Walmart store earlier this month. Organized by the Greater Cincinnati Chapter of the National Action Network, or GCCNAN, the peaceful protest featured one dozen speakers demanding Ohio attorney general Mike DeWine release surveillance video footage of that shooting that was captured by several of the store's 200 security cameras. On Friday, DeWine stated that such a release would not happen prior to any grand jury-mandated court actions because that evidence could influence potential jurors. In a recent sign of the strange economic times we now live in, Burger King, the world's second largest hamburger fast food restaurant chain, announced this past Monday its intent to buy the Canadian restaurant and coffee shop chain Tim Hortons for $11.4 billion. The new holding company will become the third largest fast food company with over 18,000 restaurants in 100-plus countries, lagging behind only McDonald's and Yum! Brands. Once approved, 3G Capital, the company's majority stock holder, will move its corporate operations from Miami, Florida to Oakville, Ontario. While big money mergers have become almost commonplace, one significant component of this deal has transcended the confines of Wall Street to spark discussions on Main Street as well as on various social media outlets. 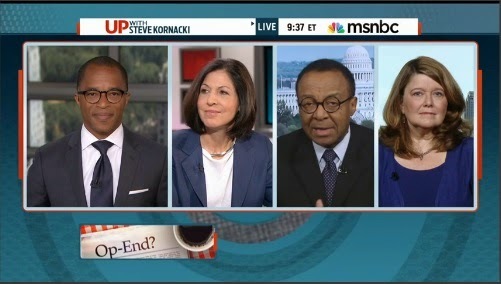 This is the fourth installment for my personal journalism-related observations of the current summer season...as promised, whether you remember it or not, this decade's influence on American culture is still evident today. 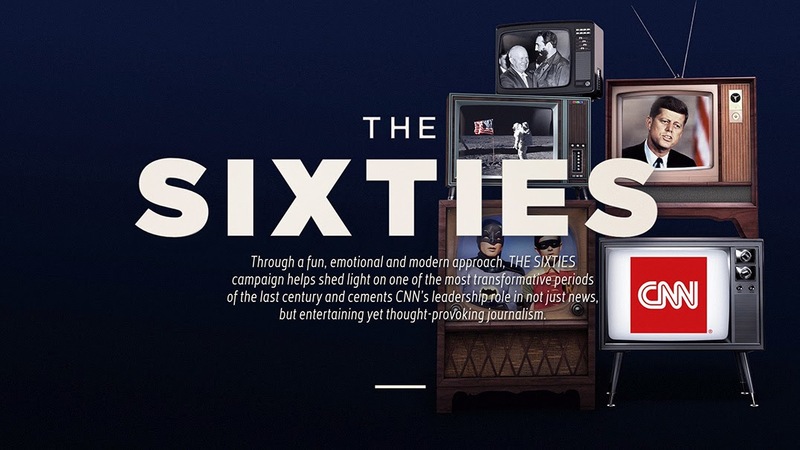 Although my own recollection of this 1960-to-1970 period is primarily of its end years and from a very youthful perspective, I have been mostly entertained by this look back on this 10-year transformational period that produced so much news and nostalgia. This series actually started last November when they aired a two-hour special on the 50th anniversary of the assassination of President Kennedy but they premiered it in an announced 10-part episodic order on May 29th (with that earlier shown offering cut down to an hour). The final episode was supposed to air on August 7th but the scheduled end-date was postponed by one week due to the sheer volume of news due to the eruption of the current Gaza Conflict and the downing of Malaysian Airlines Flight 17 in contested airspace over eastern Ukraine on July 17th. It was almost pushed back another seven days when the episode airing on August 7th was interrupted about halfway through by President Obama's announcement of US military intervention inside Iraq due to a quickly developing humanitarian crisis involving the Sunni jihadist group ISIS/ISIL. 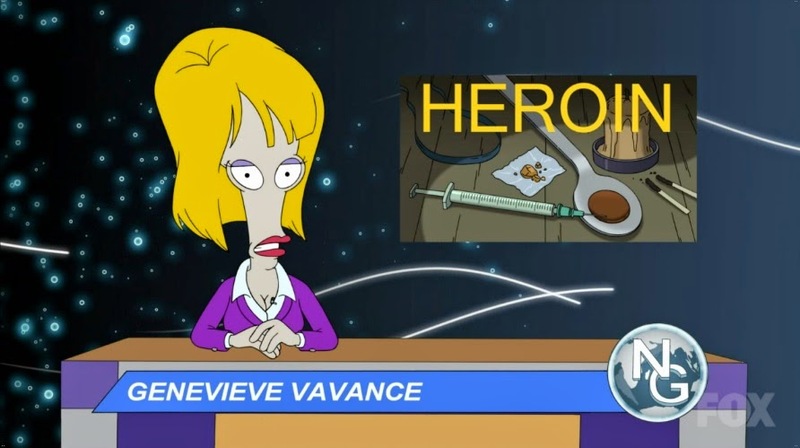 It apparently was rebroadcast in its entirety for West Coast audiences later that same night and in weekend reruns but, unfortunately, I didn't reprogram my DVR to catch that last half hour. Local writers wanted...a nice headline to see in your morning newspaper! With all of the many items that have been recently occupying my time and mental capacity, there was one thing that instantly caught my attention but took me far too long to post about it here. I was reading the Dayton Daily News on my tablet a couple weeks ago and scrolled onto the "Ideas & Voices" page, the very same one that I recently commented about on this site. In the upper right-hand corner of the displayed page were three words that immediately attracted my eye--local writers wanted! Knowing how financially strapped the newspaper industry is for content these days, I saw this as a potential opportunity to perhaps make my mark--or at least cut my teeth--as an "opinionator". I continued reading Connie Post's submission. Are you interested in contributing to our Ideas & Voices page? This is the third installment for my personal journalism-related observations of the current summer season...as promised, hard-hitting reporter, truth seeker, Curves membership. Nothing yet? How about justice hunter, philanthropist, has a Gmail account? You'll be shocked! 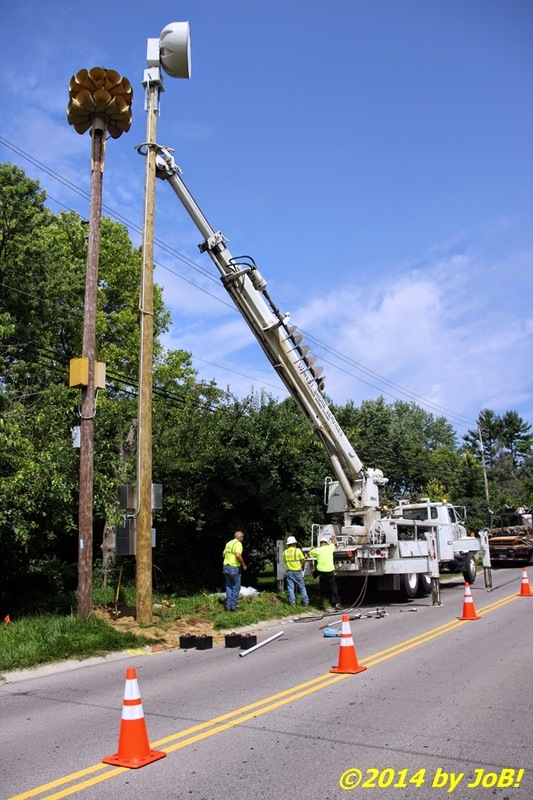 Workers erect a new outdoor warning siren next to the existing one on Fairborn, Ohio's Black Lane last Friday afternoon. Late Friday afternoon, Fairborn emergency preparedness officials came one step closer to finalizing a multi-year effort to improve that Ohio community's notification network with the installation of two new state-of-the-art outdoor warning sirens within the city. Erected in close proximity to existing Cold-War era omnidirectional alerting devices originally installed in the mid-1970s, the replacements' rotating high decibel outputs will provide a louder signal with a greater audible range than their predecessors. This increased signal distance will provide overlapping capabilities, where notifications from two or more physically separated units can be heard at the same time, in current fringe coverage areas around the city''s approximately 20 square mile area of responsibility. Technological advances in the newer models include battery backups and wireless communications to ensure greater reliability during adverse weather conditions. 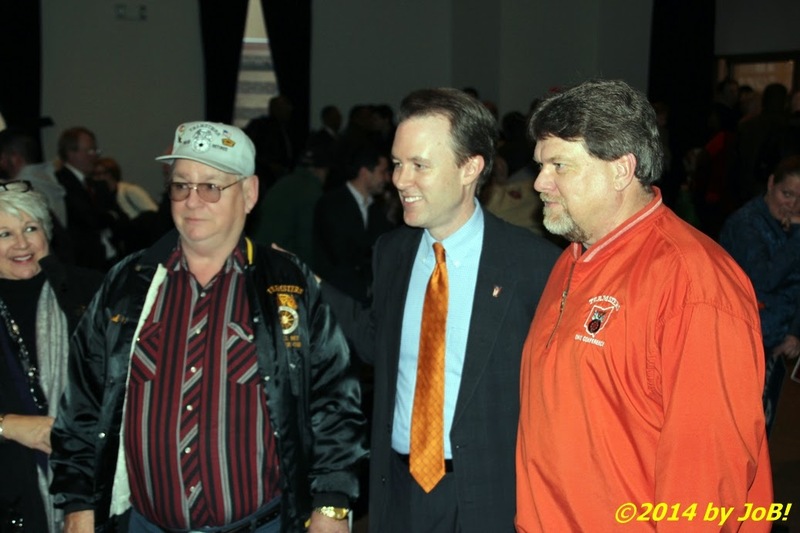 Ed FitzGerald (center) meets with supporters at a Dayton campaign rally this past January. Let me try to put this as delicately as I can--what in the wide, wide world of sports were you thinking? How could a former FBI agent believe that in the current age of bulk data storage and instantaneous access to public records that those potentially embarrassing issues from your past would not become known? And you thought that this would simply be ignored in a political climate where style—and its associated “political games”—trumps substance? In the hands of a wily opposition research operation, rather innocuous events could be spun so far out of proportion so quickly that even the most firmly established, textbook-perfect political campaigns would be vulnerable to such shenanigans (and as we have seen since you announced your desire to be Ohio's next governor, yours does not fall into that category).